What’s the Best Way to Control Medicare Costs? The NewsHour’s partner, Kaiser Health News, asked a range of health policy experts the following question: If you could make only one change to Medicare to control costs, what would it be and why? Edited excerpts of their answers follow. Darling: If I could make only one change, it would be a massive reform of Medicare’s payment policies. 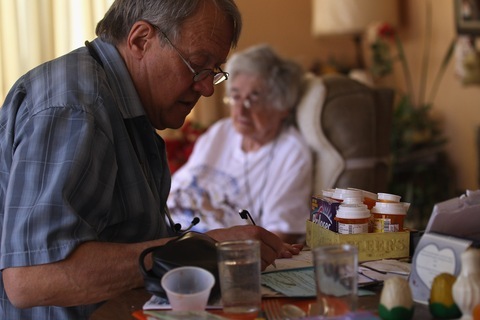 Right now, Medicare payment policies drive overuse, waste, inappropriate and sometimes harmful use of services. There should be a number of changes, such as paying in ways that encourage the use of team-based care, telephone, group and e-visits, more flexibility to allow nurses and other health professionals to operate at “the top of their licenses” with physician oversight and in the most quality and cost-effective ways. The more we can bundle payments to reward improved health (not just health care), and allow providers to self-organize to deliver the greatest benefits for patients and value or payers, the better off we will all be. The most successful providers tend to be integrated delivery systems. Although we will never have enough such systems around the whole country, we can develop and support as many of these as possible and also have payment models that foster virtual integrated delivery systems and reward the best performers, that is, the ones that provide the safest care in the most efficient manner. Anots: If we expect to bend the Medicare cost curve, we must change the financial incentives that promote the use of services. The federal subsidy cannot grow without limit, and Medicare’s payment arrangements must make that clear to both consumers and providers. Giving beneficiaries a choice of competing health plans, providing a defined contribution subsidy, and maintaining an appropriate oversight role for the government will promote more vigorous efforts by the health sector to contain costs without sacrificing access to care. The goal should be to get the incentives right to promote system improvement rather than a good budget score created by politically unsustainable spending limits. Vladeck: The single most sensible way to reduce Medicare costs would be to authorize and require Part D Prescription Drug Plans to purchase pharmaceuticals at the Federal Supply Schedule price now used by the Veterans Administration, the Department of Defense, and thousands of health centers, clinics and safety net hospitals. This would significantly lower costs for the government and beneficiaries alike. Benjamin: I would take the long view and have Medicare more aggressively promote the new prevention benefits from the Affordable Care Act. I would also find ways to incentivize providers that meet prevention targets for their population of patients. For example, tobacco use costs Medicare as much as $24 billion annually. By emphasizing prevention one can get lower costs and better health. Laszewski: I would say to the provider community that the fee-for-service payment method would be phased out in four to seven years. And here’s what the new budget looks like. There will be no turning back, so be ready. Moving away from fee for service is the only way to control health care costs in America. Ideas like increasing Medicare eligibility to age 67, you can’t do it in the 10-year budget window anyway because you’d have to give people time to plan. Also, it’s only shifting cost from the government to the private sector. Increasing Part B premiums or merging deductibles is not going to make diddly squat of a difference in the 10-year window. Medicare needs to go to competitive bidding around a budget. Johnson: If I could make one change, it would be to provide incentives to seniors to participate in prevention and wellness programs, especially for people with chronic illness and for those faced with complex long recoveries. This policy would have to apply both to fee-for-service Medicare and Medicare Advantage plans. It would require new design freedom for Medicare Advantage plans and new fee-for-service incentives and rewards to stimulate a new level of senior involvement in their health and wellness and the hard work of recovery and long term care management. Through this approach, patient-physician conversations will enable patients and their caregivers to gain a better understanding of disease processes and be ready to make more responsible end-of-life decisions. Since most Medicare dollars are spent in the last six months of life, only informed patients can preserve the opportunity for all Medicare beneficiaries to have first-class treatment by foregoing costly care that can only preserve existence. Baker: Any change to Medicare should produce cost savings for the federal government without shifting costs to people with Medicare. Allowing the federal government to directly negotiate drug rebates is an option that would considerably control costs in Medicare. This is a practice that already exists in the Medicaid program, and if it were applied to low-income Medicare beneficiaries, including those dually eligible for both Medicaid and Medicare, an estimated $135 billion in federal savings could be achieved over 10 years. Allowing the government to negotiate rebates for all Medicare beneficiaries with a prescription drug plan could save up to $156 billion in federal spending over the same period of time. At the same time, people with Medicare could save up $27 billion. This is the type of change we need for Medicare–a cost saver, not a cost shifter. Bertolini: We need to move Medicare away from the current, outdated, fee-for-service model that pays providers for activity and move to a payment model that pays for the quality and value of care delivered. We’ve seen the success that Medicare Advantage has had in delivering higher quality, better coordinated benefits that lead to better outcomes and higher patient satisfaction. We would like to build off of these sorts of successes as a way to better serve Medicare members, continually improve their satisfaction, and deliver the cost savings necessary to ensure the program is sustainable for future generations. Ginsburg: The most promising strategy for Medicare is in provider payment reform. Medicare can use its size and credibility to move the entire health care delivery system away from fee for service and towards broader units of payment. Medicare has had a very promising start to piloting accountable care organizations and medical homes, and I am hopeful on bundled payment as well. Efforts to coordinate with private payers and Medicaid programs reflect recognition that payment reform can only succeed if major payers are using consistent approaches. But current initiatives will not yield substantial budget savings because they depend on volunteers. A transition will be needed from pilots to approaches that penalize those providers remaining in fee for service. Aaron: My most preferred change to Medicare would be a fully financed benefit increase–to add full coverage of catastrophic health events — linked to the elimination of the distinctions among parts A, B and D (unified deductibles and cost sharing) all financed by a premium increase sufficient to make the overall package neutral with respect to the federal budget. But if you want to focus on cost reducing measures, my first choice would be an increase in Medicare’s administrative budget that could be applied to two purposes: more thorough investigation of fraud; and more careful enforcement of Medicare policy regarding the application of technologies approved for selective health conditions to assure that those technologies are not misapplied to situations where safety and efficacy have not been shown. Finan: We are concerned about shifting the conversation away from Medicare cuts to more efficient use of resources and greater emphasis on health outcomes. We know that in terms of care delivery today, a cancer patient has to see many providers to get care, the providers don’t work together very well and that results in higher costs. When you get more coordinated care, health outcomes are better and costs are lower. There is also more consideration of what patients’ needs are during treatment, which is often very traumatic. Coordinating care is on the table in the discussion about controlling Medicare costs, but it is not as prominent as it should be. Whitman: Changing the way Medicare pays doctors would accelerate efforts to improve health care outcomes, safety, and efficiency; lead to more collaboration among providers; support care coordination; and achieve greater accountability for the cost and quality of care from the clinical community. While Medicare is just one part of the broader health care system, it plays a leadership role. New payment models, such as episode-based payment, bundled payment and capitated (global) payment, are inherently more patient-centered and would signal Medicare’s readiness to align its payment structure with other payers who have initiated value-based purchasing strategies. Moving away from fee-for-service would enable Medicare to better manage program spending, while incenting care coordination, care management, and unnecessary hospital readmissions. Encouraging value by changing the way Medicare pays is a “triple win” for people on Medicare, taxpayers and the Medicare program itself. Hobson: I would increase the Part B copay 25 to 30 percent, increasing 1 percent per year over five years. I think over the years we have sold Medicare to beneficiaries as almost something for nothing, while at the same time cutting providers. And you do get to a point, where if you cut the providers enough, there’s nothing left. I think the system needs more money, so I would do it that way. Moffit: Congress should intensify competition through the adoption of a defined contribution system of financing — premium support — giving beneficiaries a generous and income-adjusted contribution toward health plans, including traditional Medicare, of the enrollees’ choice. By compelling health plans to offer catastrophic protection while requiring plans and providers to compete on a level playing field for enrollees’ dollars, as they do today in Medicare Part D, Congress would spur innovation and efficiency, and secure higher productivity and quality in the delivery of medical services. Such intense competition would be the best means to slow the growth of Medicare costs for both beneficiaries and taxpayers. Goldberg: First I would say to wait and see if the demos and pilot programs in the health law actually work. I think there is tremendous potential there to reduce the growth of Medicare’s expenditures and improve quality of care, but right now we’re just not sure yet. The other thing that’s related to that, that’s more proactive is moving Medicare away from the silos, where you have Part A, Part B, and you have a trust fund for Part A and premiums for part B. At some point we are going to need to integrate all that and that’s going to help us with the integration of care coordination. One thing I would definitely not do is increase the age of eligibility. It’s an example of just shifting costs. You may reduce the cost to one place but you are increasing costs in other places. If you shift the age from 65 to 67, those folks’ health care needs don’t go away in those two years — it’s just not a good idea. This article was produced by Kaiser Health News with support from The SCAN Foundation. Kaiser Health News is an editorially independent program of the Henry J. Kaiser Family Foundation, a nonprofit, nonpartisan health policy research and communication organization not affiliated with Kaiser Permanente.